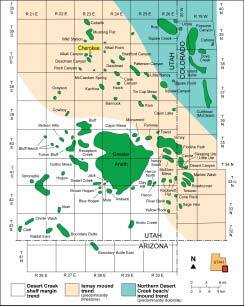 Location map of the Paradox Basin, Utah and Colorado, showing producing oil and gas fields. Over 450 million barrels of oil have been produced from rocks deposited in a warm, shallow sea 310 million years ago during the Pennsylvanian Period in the Paradox Basin of southeastern Utah. Within this sea, reef-like buildups or mounds of green (phylloid) algae (similar to seaweed) created traps for oil in the Paradox Formation. Nearly 100 oil fields produce from the Paradox Formation including Utah’s largest, the 425-million-barrel Greater Aneth field east of the town of Bluff. However, most of these fields are small, one to ten wells, and contain 2 to 10 million barrels of oil. Only 15 to 25 percent of this oil is recovered given the current geologic understanding of the rocks and using standard production techniques. The Utah Geological Survey (UGS), with funding from the U.S. Department of Energy (DOE) as part of its Class II Oil Revisit Program, is conducting a detailed study of Cherokee oil field, operated by Salt Lake City-based Seeley Oil Company. Cherokee field, which has produced 182,000 barrels of oil since it was discovered in 1987, is typical of the small fields in the basin. The goal of the study is to ultimately double the amount of oil that is produced from this field, and others like it. To achieve this goal we must gain a better understanding of how oil is stored in the rock, called reservoir rock, and how it flows to the well. Oil accumulates and is stored in the rock’s pore spaces like a sponge holding water. For the oil to flow, the pores must be interconnected or permeable, the measurement of which is called permeability. 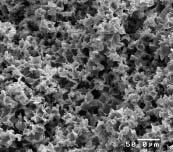 The more pores and the higher the permeability in the reservoir, the more oil that can be stored and produced. In the Paradox Formation, pore spaces occur between the “leaves” of algae like spaces in a bag of potato chips, and in the case of Cherokee field represent 12 percent of the rock. However, over time things can happen to the pores in the oil reservoir that affect how they are connected. Fresh or magnesium-bearing water can enhance or create new pores, while later mineralization or tar-like oil (bitumen) can plug up pores and their connections. These changes are referred to as diagenesis. Geologists use “up close and personal” techniques to examine the pores in reservoirs, and for Cherokee field the UGS has identified possible compartments of undrained oil that could significantly increase the field’s production. Similar undrained compartments may be present in other fields in the Paradox Basin. One of the standard techniques used to study an oil reservoir is to make a slide (called a thin section) of the reservoir rock and examine the pores under a microscope. When some of the wells at Cherokee field were drilled, a special drill bit was used to obtain core from the Paradox Formation. After describing the core, small samples were collected to make thin sections and conduct other special tests. Samples for thin-section analysis are impregnated with a special blue epoxy that fills all of the pores. The samples are then glued to glass slides, the bulk of the samples sliced off, and the remaining portions are ground down so thin that light will transmit through them. 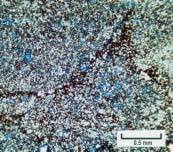 Under the microscope, one can observe the types of minerals present and, most important, the pores (seen as blue areas). Photographs taken through the microscope of thin sections are called photomicrographs. From the thin sections of Cherokee field, we observe various types of pores including shelter pores (pores between algal leaves [plates]) and pores formed or enlarged by fresh water dissolving algal plates, fossils, and limely sand grains (moldic or vuggy porosity). 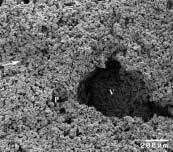 Other pores are clogged with anhydrite (a late-forming evaporite mineral) and bitumen. However, the most significant and unique diagenetic characteristic observed in the Cherokee field thin sections is extensive small-scale porosity, or microporosity, that developed between crystals of the mineral dolomite. Our preliminary interpretation is that the intense microporosity developed late, by the action of hydrothermal solutions from depth (carbon dioxide gas escaping from 350-million-year-old [Mississippian Period] Leadville Limestone or from deeply buried organic matter). To get an even better understanding and view of these various diagenetic features, geologists use a special microscope, the scanning electron microscope (SEM). The SEM not only produces images at incredibly high magnification (from 15x to 200,000x), but does so showing every detail with extreme clarity in three dimensions. The SEM is commonly used to examine insects, plants, and bacteria, so why not rocks and minerals. Unlike the conventional microscope that uses light waves to observe thin sections, the SEM illuminates the rock samples with electrons in a vacuum chamber. The samples must be able to conduct electricity and are therefore coated with a very thin layer of gold by a machine called a sputter coater. The sample is then placed inside the SEM’s vacuum column and an electron gun emits a beam of high-energy electrons downward through a series of magnetic lenses that focus the electrons to a very fine point. The focussed beam moves back and forth across the sample, releasing electrons from its surface; these electrons are counted by a detector to build the final image (which is black and white). All Cherokee samples exhibit microporosity whereas others exhibit additional pore types such as moldic and vuggy porosity. Microporosity is also well displayed by the pore casts which show the pores are well connected, thus allowing oil to flow to a well. Other SEM images show how some of the large pores or vugs have been essentially filled with the mineral anhydrite while others remain open and thus capable of storing oil. 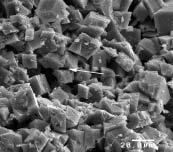 Occassionally, different minerals, such as calcite and clay (smectite), fill pore spaces. Large blobs observed on some of the SEM images (see cover inset photo) represent bitumen, the solid hydrocarbon that can clog the interconnections between pores and reduce the ability of oil to flow through the rock. 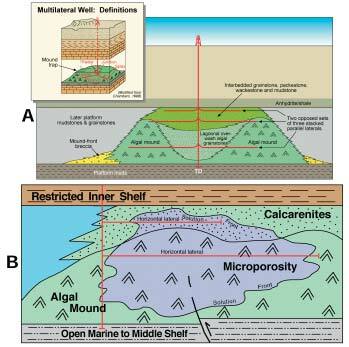 Microporosity represents an important site for untapped hydrocarbons and possible targets for horizontal drilling. Techniques developed in the late 1980s and early 1990s allow wells to be deviated from vertical to horizontal with the drilling direction and depth carefully controlled. More reservoir rock is encountered in horizontal wells, reducing drilling costs and risk while increasing production and reserves. Through proper geological evaluation of reservoirs, oil production may be increased 20 to 50 percent as a result of drilling low-cost single or multilateral horizontal legs from existing vertical-development wells. In addition, horizontal drilling from existing wells minimizes surface disturbances and costs for field development, particularly in the environmentally sensitive areas of southeastern Utah and southwestern Colorado. An extensive and successful horizontal drilling program has been conducted in the giant Greater Aneth field. However, to date, only two horizontal wells have been drilled in small Paradox Basin fields. The results from these wells were disappointing due to poor understanding of the reservoir rocks and diagenetic changes that affect the flow of oil to the well. The hydrothermally induced microporosity in Cherokee field could be drained with radially stacked, horizontal laterals and splays drilled from an original vertical well. The field already contains four vertical wells from which multiple horizontal laterals could be extended to penetrate undrained oil trapped in microporosity and other potential targets. Depending on the results of the UGS study of the reservoir characteristics, and successful field testing, these techniques can be applied to numerous small fields throughout the Paradox Basin.